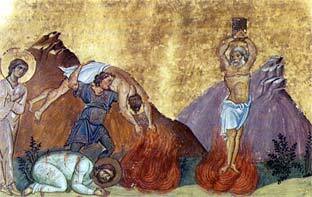 The Martyrs Carpus, Papylus, Agathodorus and Agathonike suffered at Pergamun during the persecution of Decius in the third century. The governor of the district where the saints lived discovered that Carpus and Papylus did not celebrate the pagan festivals. He ordered that the transgressors be arrested and persuaded to accept the Roman pagan religion. The saints replied that they would never worship false gods. The judge then ordered them to be bound in iron chains and led through the city, and then to be tied to horses and dragged to the nearby city of Sardis. Agathodorus and Agathonike voluntarily followed after Carpus and Papylus. 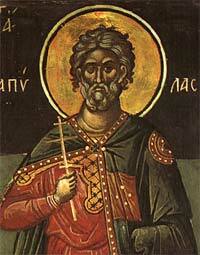 St Agathonike was choked to death with ox sinews and Sts Carpus, Papylus and Agathodorus were beheaded in Sardis. During his life St Papylus was known for his gift of curing the sick. 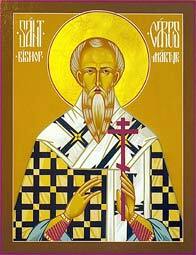 Since his martyrdom, he has granted healing to all who pray to him with faith. through their sufferings have received incorruptible crowns from You, our God. 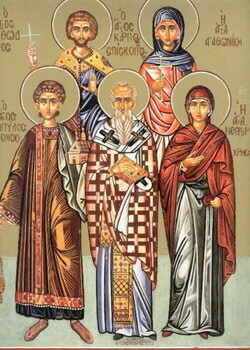 Podoben: "As You were voluntarily raised..."
and so with one accord we celebrate your feast with love, Carpus and Papylus.